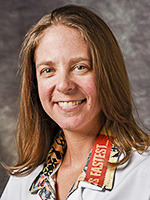 Marie Crandall, MD, MPH, FACS is Professor of Surgery at the University of Florida Jacksonville and the Director of Research for the Department of Surgery. She is currently a member of the Division of Acute Care Surgery. Dr. Crandall performs emergency general and trauma surgery, staffs the SICU, and is an active health services researcher. She has published extensively in the areas of injury risk factors and outcomes, disparities, geographic information systems in trauma research, gun violence, and violence prevention.